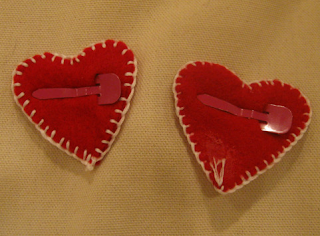 Inspired by the tutorial at Kro Designs I made these adorable felt heart hair clips for Pinky today. I had planned to embellish these but once I got started I found that I really liked the simple look instead. Pinky wants to wear these to school tomorrow. Is it too early to start wearing Valentine's Day stuff? Those are adorable!!!! It's not too early for Valentine's Day stuff... I say let her go for it! Super cute! 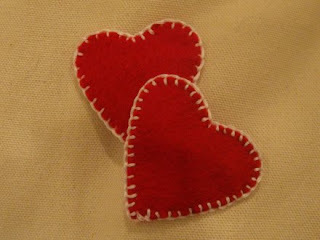 I might use the tutorial you linked to make a cute Valentine's day pin. So cute! I'll have to make these with some of the leftover felt from all that food I made!